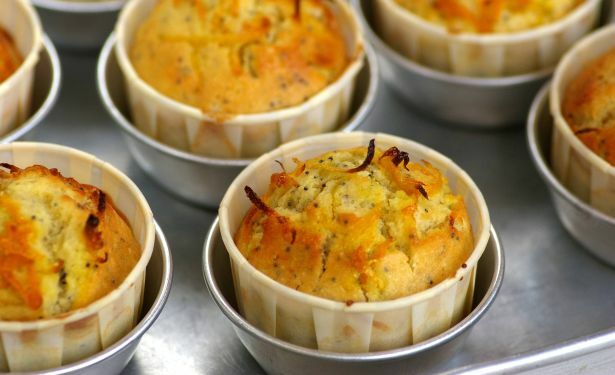 Line a muffin pan with paper cases. Preheat oven to 200°C. Sift flour, baking powder and salt into a large bowl. Stir in sugar to mix. Rub in butter lightly and mix into a crumbly mixture. Combine ingredients (A) in a small saucepan. Cook on low heat to a gentle boil. Allow to simmer until sugar is dissolved, at least 2-3 minutes. Remove contents from pan and leave to cool completely. Add eggs, yoghurt, milk, and sugared lemon and orange rinds to the crumbly mixture. Stir with a wooden spoon until mixture is combined. Add poppy seeds. Divide mixture evenly between muffin cups, filling each to three-quarters full. Spread a little sugared lemon and orange rind over each muffin. Bake for 20-25 minutes or until muffins are well risen.